Middle Fork of Licking 78 miles up stream of Paddlers’ Inn. At Thaxton’s Canoe Trails, we offer canoe, kayak, raft and tube trips on an internationally recognized Class I river. Class I means the river provides a gentle current with rapids of less than 1 foot. This makes it ideal for novice paddlers and all those who enjoy nature. We cater to families, scout groups, church groups and friends seeking a memorable outdoor recreational experience. 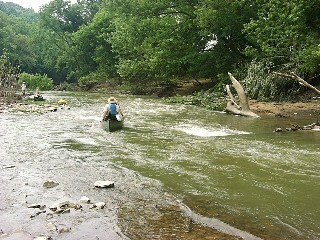 We operate on the South Fork during early spring and after summer rains. The South Fork is island strewn and rated as an outstanding small mouth bass fishing stream. The Main Licking River is recognized by the Kentucky Division of Water as and outstanding water resource and it offers many ideal trips throughout the summer and fall. It is dam controlled and typically holds adequate water even when other rivers throughout the tri-state are too low to float. For those seeking longer trips, the Middle Fork provides over 150 miles of wilderness paddling opportunities. Riverside camping and fishing are available on all the waterways we serve. We also offer paddling on the head waters of Kincaid Lake. Our guests have reported seeing an abundance of wildlife including blue heron, hawks, osprey, a variety of geese and ducks, and song birds. They have also encountered otter, beaver, muskrat, deer, fox, raccoons, and other mammals in their natural state. In addition, the river supports 25% of the United States population of fresh water mussels.